The Office of the Chief of Police includes the Department Administration Division, which provides policy and leadership direction. The Chief’s Office also includes the Professional Standards Bureau, Media Relations, Budget and Financial Management, Grant Administration, Court Services, Records Management and the Personnel & Training unit which handles the hiring of all employees. The Training Unit is responsible for State POST and Federal mandated training, in-house training, certifications, personnel background investigations, and processing applicants and volunteers. 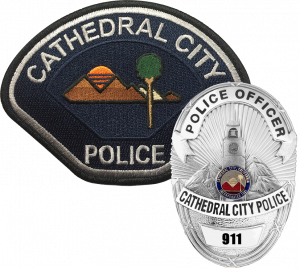 The Administration Division oversees the Department’s Citizens on Patrol Program, Crossing Guards, Cathedral City Police Explorer Program, Cathedral City Police Reserve Officer Association, and Police Cadet Program. Field Services Operations Division, the largest division of the Police Department, is comprised of the Patrol Bureau, Traffic Bureau, and Gang Unit. This division is responsible for the following: first police response to emergencies; preliminary and follow-up investigations on property, person, grand theft auto crimes; and basic police patrol services. Watch Commanders are responsible for the daily operations of the Patrol Bureau and any collateral assignments. The Field Training Officer (FTO) program provides training to all new police recruits. The Traffic Bureau provides enforcement, education, parking, 30-day impounds, and accident Investigation follow-up. The Investigation Division is comprised of Detectives, Specialized Detectives and Evidence Units, and is responsible for conducting critical incident investigations, follow-up criminal investigations, and preparing cases for prosecution. The Investigation Division's investigations include homicides, officer-involved shootings, assaults, armed robberies, sexual assaults, domestic violence, fraud cases, computer crimes, and identity theft. Specialized Detectives conduct investigations of cases involving drugs, vice activities, criminal intelligence gathering to include gangs, and dissemination of intelligence information. Specialized Detectives also provide assistance to State drug task forces. Current CCPD Task Force Membership includes: Coachella Valley Narcotics Task Force (CVNTF), Coachella Valley Violent Crime Gang Task Force (CVVCGTF), Real Estate Fraud (REF) Task Force, and Post Release Community Supervision Accountability Team (PACT). The Evidence Unit supports the Detective Bureau and collects and processes seized evidence from crime scenes. Emergency Communications answers all 9-1-1 emergency telephone calls in the city. All emergency requests for police, fire, and medical aide are routed through the Dispatch Center. Additional services include maintenance and administration of all radio systems infrastructure, emergency telephone communications equipment, and FCC radio licenses. Animal Control Services is currently contracted through the Riverside County Health Department Animal Services Division and is responsible for the enforcement of State and City animal control laws and codes. Police Field Services provides direction and oversight for the Police Cadet Program. This program was created to help groom local young residents to fill future Police Officers and Law Enforcement positions within the Department. The success of the Cadet Program is reflected through the goals and accomplishments of Police Field Services.